This road map gives you concise information on which data you can find here, differences between them and their limitations. You can access the data by clicking 'Figures' below each individual Fact. More detailed information about the individual data sources can be found in the report Data Sources; A comprehensive overview. Where do I find the real numbers of traffic casualties? In the graph below you can see the development of the real numbers of road deaths and serious road injuries. You can find more information in the Fact sheet Road death in the Netherlands and in the Fact sheet Serious road injuries in the Netherlands. More real numbers and various differentiations can be accessed below via 'Figures'. N.B.Due to statistics legislation and reasons of privacy no tables can be made including all characteristics;simultaneously, but a separate table must be consulted for each characteristic. 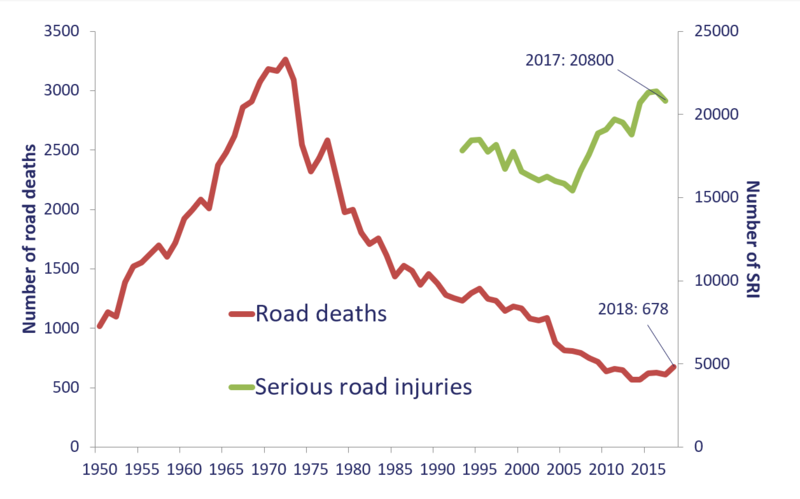 In addition the number of registered crashes in the Netherlands has declined considerably and therefore the differentiation by characteristics not made for serious road injuries. What is the difference between real and registered numbers of casualties? With regard to the number of casualties we distinguish between the real number and the registered number of traffic casualties. The real number of serious road injuries is not known precisely, because not all traffic casualies are registered by the police, hospitals or other organizations of institutions. The real numbers in our tables have been determined by comparing the registered numbers from twe sources and estimating the real numbers by using a set prcedure. The real number of road deaths, on the other hand, is entirely based on registrations. More detailed information about how the numbers of road deaths and serious road injuries are determined, can be found in the report Data sources; Comprehensive overview. How is the real number of serious road injuries determined? The real number of serious road injuries is determined by combining the police registration (BRON) with the hospital register (LBZ). When is a casualty labelled a serious road injury? Serious road injuries are persons who have sustained severe injury in a road crash. These injuries are partly described in the National Basic Register Hospital Care(LBZ -previously National Medical Register, LMR) that is managed by Dutch Hospital Data, commissioned by the hospitals. The definition of a 'serious road injury' is a casualty who has been admitted to and has received treatment in a hospital (in the Netherlands) ith injuries of an AIS value of 2 or higher AIS is short for Abbreviated Injury Scale. The value of an injury on this scale indicates the severity of the injury. The value of the most serious injury the casualty has sustained is indicated by the Maximum AIS (MAIS). The real number of serious road injuries is determined by linking LBZ and BRON and correcting for casualties that have not been included. What are the differences with the period before 2010? traffic casualties who are admitted to hospital are not necessarily (seriously) injured. Occasionally they are only admitted for observation. the information on the police form is not always correct. Many traffic casualties who, according to BRON, have been admitted to hospital, cannot be retrieved in LMR/LBZ. Study has shown that these casualties were sent home after treatment in the A&E department. On the other hand, there are also casualties who according to the police only sustained minor injuries , but were actually admitted to hospital with serious injuries. In 2010, these findings resulted in a new definition of seriously injured casualties: "serious road injuries". Since then this definition is also used by the Ministry of Infrastructure and the Environment for monitoring and road safety policy. More detailed information about determining the number of serious road injuries is available in the report Data sources; Comprehensive overview. What information do I find in the police road crash registration (BRON)? BRON contains the crashes that have been registered by the police and offers important information for road analyses. Often, nature and extent of the road safety problem are first determined on the basis of this register. From late 2009 the number of registered crashes declined considerably due to changes that took place within the police force. Since 2013 the number of registered crashes has been increasing again as a result of including crashes that are registered with a characteristics+ mention. Therefore the fluctuations in the numbers after 2009 do not necessarily indicate road safety changes. More information about BRON and the registration rate of the Road crash registration can be found in the report Data sources; Comprehensive overview. Which crash types do we distinguish? Statistics use different types of road traffic crashes. An occurrence on a public road that is traffic-related and that results in damage to objects or injury to persons and in which at least one moving vehicle is involved. Road traffic crash in which no other road users or objects are involved. These are crashes in which the vehicle goes off the road or rolls over. This crash type also includes cyclists who fall. Road traffic crash in which no other road users are involved. These are vehicle-only crashes as well as crashes with a loose or fixed object or with an animal. Road traffic crash in which one or more persons sustained injury. The word 'risk' is used to express the safety level in traffic. To compare the number of crashes of various groups, such as countries, modes of transport or road types, we can relate the number of casualties to mobility. This involves determining the risk: the number of casualties per distance travelled (e.g. kilometres travelled). Risk therefore not only takes into account the number of casualties (in a group), but also the distance travelled (by that group). 'Risk in traffic' can be defined as the risk of a crash, of a road death or of a serious road injury. risico SWOV mostly works with the definition 'the risk of being a road crash casualty'. The definition 'risk of a crash is not used, among other things because a crash can involve various types and numbers of casualties, making a crash a more complex unit than 'casualty'. Often the number of casualties is also more relevant than the number of crashes, because, overall, the prevention of casualties is more important. Which data is necessary to determine risk? Preferably, mobility data is used to calculate risk. If no mobility data is available, other data ( size of the vehicle fleet, size of the population, distance travelled by motor vehicles) can be used instead of mobility data. Ideally, risk is calculated using the real numbers of road deaths and serious road injuries. For some analyses insufficient characteristics of the casualties are available if the real numbers are used. In those cases the analysis can be made using the registered numbers if they do contain the rquired characteristics. However, the results must be interpreted with care; one should consider that the results do not fully reflect the actual situation. More detailed information can be found in the archived SWOV Fact sheet Risk in traffic. More about road user mobility. In the report Data sources; Comprehensive overview you can find more information about the registration rate. What do we know about road user mobility? The annual number of road traffic crashes in a country is determined by the distance travelled by persons in that year and in that country (mobility) and the risk of a crash while doing so. this risk is related to various characteristics of the distance travelled: the risk differs between type of road user, road type, time of day, etc. How is road user mobility measured? The road user mobility in the Netherlands is measured with a continuous survey about their mobility among a sample of the population. This survey has some limitations, such as trend reversals due to changes in measuring methods, differences in sample size, and the fact that not all mobility in the Netherlands is included. Professional transport and foreigners who travel in the Netherlands are absent. The number of driving licence holders can also be used as an indication of road user mobility. From 1985, driving licences ownership is made available by the Mobility Study Netherlands (OVG/MON/OViN). The most recent trend reversal in these statistics occured in 2010 due to the transition towards a new measuring method (OViN). More information about road user mobility can be found in the report Data sources; Comprehensive overview. SWOV uses different data sources for its research. Some of these sources are public, others are not. The SWOV website presents a substantial part of the data in graphs, tables and fact sheets and with the help of the 'Qlik Analytic Platform'. This allows you to get started with the available data and make and export your own selections. SWOV (2017). Road map - Road safety data, SWOV data sheet, May 2017. SWOV, The Hague. N.B. For each data table in Cognos the sources are given on which the table is based. With due acknowledgement of these sources, the data can be used for your own purposes. SWOV is not liable for third party use of this data and no rights can be derived from such use.